The image to the right is a demodex mite. You can only see it through a microscope. This is a boxer that came into a rescue shelter on June 7th, 2010 in this condition with demodex. This is how the previous owner neglected Eddie by not keeping his immune system high and also not giving him the medical attention he needed. 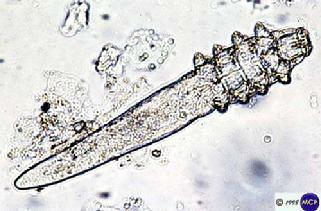 I know demodex is not a pretty sight. View these videos that were found on YouTube so you can see the seriousness of demodex. Many animals have died from this being untreated. plus the strain on your puppy/dog.